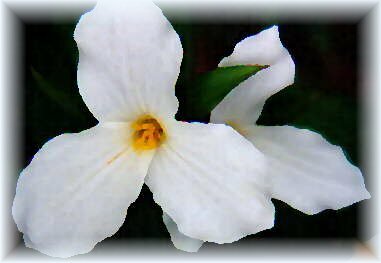 The Province of Ontario selected for its Official Flower, a beautiful and delicate white flower named for its pretty pink tinge and three petals, the Trillium. The white blossom, with three small green leaves in the shape of a star, cannot be picked without also removing the star-like leaves which will cause the entire plant to die. 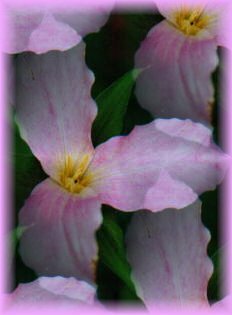 It is illegal to pick trilliums. 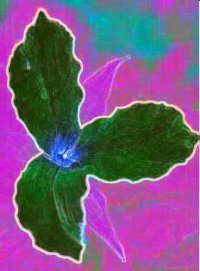 A three-petalled flower is so rare and unusual that there was a very special reason for its creation. Legend has it that almost 400 years ago, one of the Jesuit Fathers sent over to Canada by the King of France to teach Christianity to the native people, learned from some of his pupils that there were many more native peoples to the West. He had a great desire to bring the Word of God to as many people as he could. He decided to explore this unknown land and, crossing the Ottawa River in a small native canoe, entered into what we now know as Ontario. He found that the native people he met here could not understand the language that he had learned from their brothers to the east. He searched everywhere for a solution to this communication problem. One day he noticed that growing all around in the forest were many pretty white flowers. The four petals formed the shape of a cross. These he thought, he would use to teach the native people how Christ was crucified. With the help of the little flowers he was finally able to explain to them how Jesus had died for them. Most native people would never harm a friend and they only became very saddened by the story and avoided his company. Understanding this, he plucked one of the petals from the flowers and used the remaining three to teach them about The Father, The Son and The Holy Spirit and the little star-shaped green leaves behind the flower helped him to explain the Miracle of Christ's birth. He prayed that some sign would be sent to remind the native people of his teachings. To his great delight and wonder, the flowers that he had used had only three petals when they came into bloom the following year and since that time have never changed. This page was updated on May 9, 2008.